Five years ago today a strong and borderline violent tornado tore through Western Massachusetts. It was the strongest and deadliest storm to hit MA since 1995. Portions of downtown Springfield were in ruins as were several towns further east. Three people died and nearly 300 were injured. The tornado caused around $160 million in damages. A superb severe weather set up was present by 8 AM on June 1, 2011. A strong surface cyclone in Ontario sent a warm front into surging into Northern New England. In its wake a surge of warm tropical air with dew points into the 70's. Meanwhile in the wake of the cyclone very dry air was dropping into the Midwest. Surface winds were out of the south but at 14-18K ft they were more westerly creating strong wind shear. The Storm Prediction Center recognized the threat and had most of New England in a severe weather risk area. Already by 9 AM an initial wave of severe thunderstorms erupted in South Central/Eastern MA & N RI. I remember working outside and running for cover as these storms moved into the Blackstone Valley. These were among the strongest thunderstorms I had ever witnessed and it was early in the morning. I knew then that the atmosphere was primed for severe weather. A rather severe squall line ripped through the Merrimack Valley. Here is what the storm looked like on radar at this time. The damage in Springfield was severe in the downtown area. Parts of Springfield College were destroyed. See photos of damage here. There was no quit in the tornado as it moved into Southwest Worcester County after destroying many structures in Monson and flattening the Route 20 campground in Brimfield, MA. The tornado reached its maximum width with moving through these communities. The tornado damaged homes and structures in Sturbridge and Southbridge, MA before lifting off the ground near Webster/Oxford, MA. The severe thunderstorm continued down Route 20 into Southern Worcester County. I would say the Blackstone Valley should be grateful this storm ran out of energy when it did. June 1, 2011 will not go down as an all time US tornado like the April 27 storms or the Joplin storm of the same year. However it is a reminder that Southern New England can and does get destructive tornadoes. Next week I will review Massachusetts greatest tornado which happened to take place in Worcester. The lightning show that night was something special as thunderstorms continued after sunset despite the loss of the sun. Many people stayed in to watch the Bruins battle the Canucks in Game 1 of the Stanley Cup Final. Meteorologists learned a lot that day that we will use to be prepared for the next June 1, 2011 type event. Mostly dry and seasonable conditions are in store for Southern New England this week. Memorial Day is traditionally the unofficial start of summer. June 1 is the start of meteorological summer. Temperature will not be as warm this week as they were the end of last week but they will be in the mid 70's. Once again the coastal areas will be cooler than the interior. That second cold front along the Great Lakes and into Quebec/Ontario will move through overnight and it will be dry. Temperatures drop into the 50's. A cooler air mass accompanies the cold front tonight. 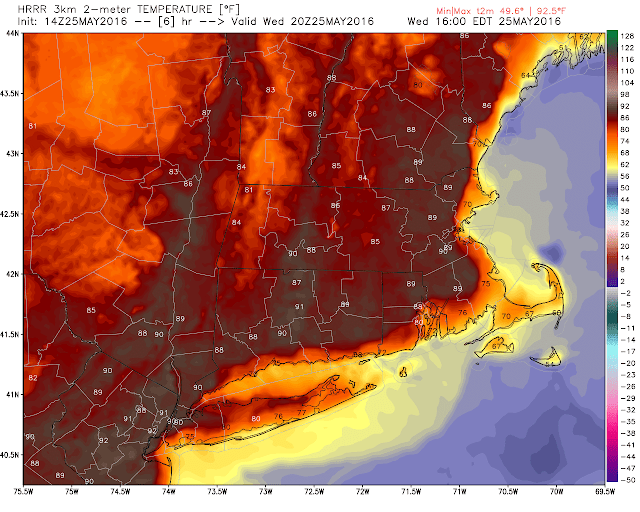 Winds will also shift to the east keeping temperatures in the 60's near the coast, 70's in Metrowest/Central MA and low 80's in the Connecticut River Valley. This will keep temperatures down in the eastern part of the state again Thursday. 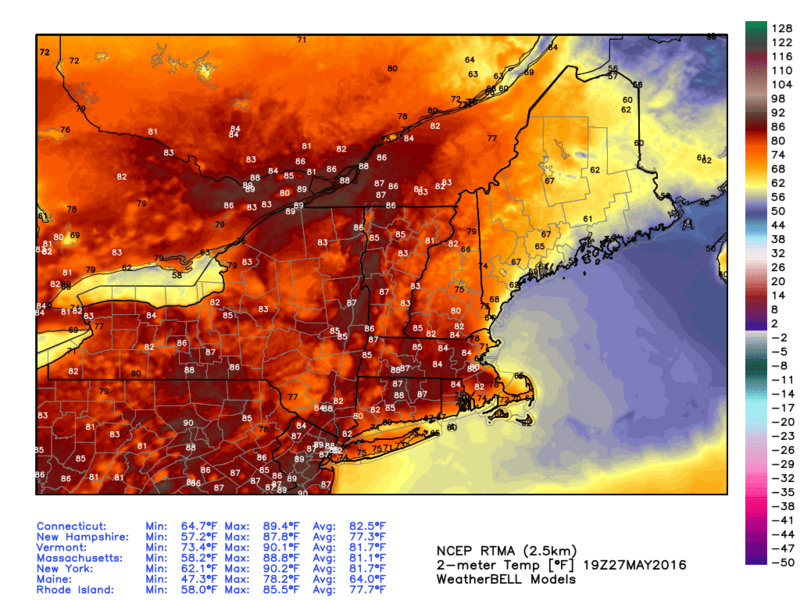 In Central and Western MA highs will remain in the low to mid 70's. No precipitation through this period. High temps will linger in the low 70's. More on the weekend forecast tomorrow. Tomorrow is also the first day of the Atlantic Hurricane season (although 2 storms have already formed). 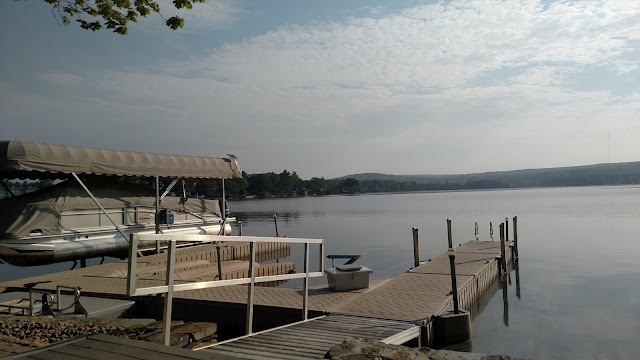 I get the feeling a lot of people called out of work today judging by the boat traffic on Webster Lake. If you didn't don't worry the long weekend looks warm and mostly dry through Sunday evening. There will be isolated showers and thunderstorms each day but these will last only an hour or two. Guidance has continually over-forecast showers/thunderstorms each day this week so let's hope that continues. Monday is a different story. I am fearing a wash out. Now looking at the temperatures the coast continues to suffer from the sea breeze. It is much warmer inland. Logan Airport currently reads 65 while it is in the mid to upper 80's outside of I-95. A bit early in the season for a day like this. This is more like a 4th of July day but I will take it. On Valentine's Day it dropped to -13 in Worcester . Perspective. 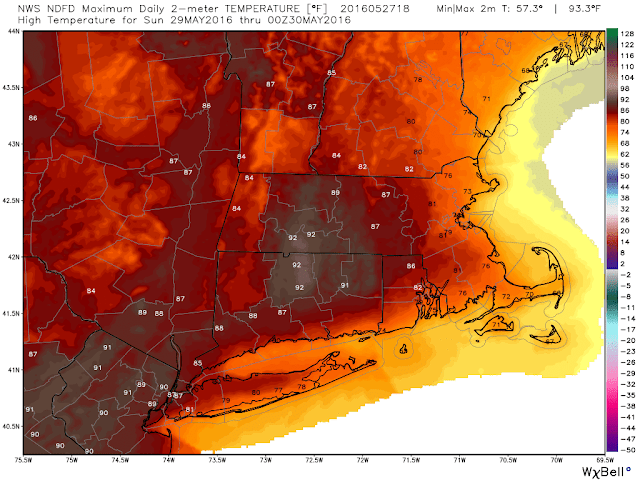 So if Worcester gets to 87 tomorrow (and they should) they will be 100 degrees warmer than Valentine's Day. Most weather stations will read 90 tomorrow except for the Cape/Island and South Coast. Why so warm? A subtropical area of high pressure known as the Bermuda high is in perfect position to send southern air our way. A front is hung up in the Midwest producing severe weather while we get a early taste of summer. With this air mass some showers/thunderstorms will pop up. My best guess for storms is South of the Mass Pike and west of 395 before 8 PM and then maybe into the Blackstone Valley around 9-10 PM. The cold front in Northern New England will try to creep south on Sunday. It will make some progress but ultimately it will fail and get hung up in Southern NH. I am optimistic precipitation stays to north and west during the day Sunday. Sunday evening into the overnight hours precipitation will begin to fall. Tricky. 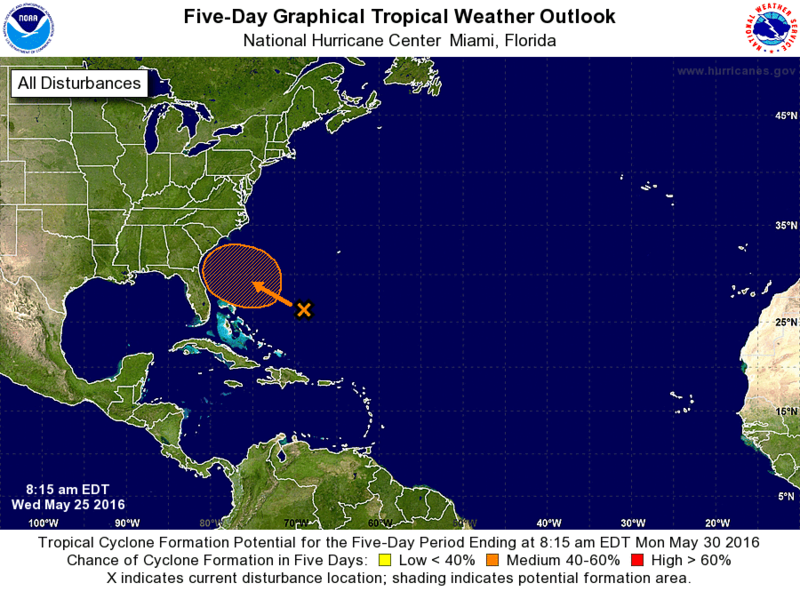 A Tropical Depression has formed in the Southwest Atlantic. It will track towards the Carolina's and make landfall as a weak Tropical Storm named Bonnie. Whatever is left of this will likely pump moisture up the coast overnight Sunday into Monday morning. At the same time a cold front will be approaching from the west. Given that this rain will have roots in the tropics temperatures Monday won't be all that bad. Most people are in the mid to upper 70's. Let's hope this can clear out early enough in the afternoon so we can enjoy the day. Honestly that doesn't seem likely but who knows. The weather does what it wants. I'll keep an eye on the radar but I'll watching Monday closely. Have a safe and Happy Memorial Day weekend. I've talked about the Memorial Day weekend several times already so I won't beat a dead horse. I will update it tomorrow but I like my forecast. I remain concerned about where exactly rain will set up on Sunday afternoon. My advice to anyone who lives in Worcester County to the the coast to have a back up plan in case it rains. This includes Rhode Island. For more info on the week please watch the video below or see this post. As of 4 PM a few sprinkles were present in Southern New England but no organized showers or storms. Temperatures tonight only fall to the low 60's. Similar weather tomorrow. I'll get to my Saturday/Sunday/Monday update tomorrow. There is some interesting weather elsewhere in the States that I want to touch on. Another incredible video can be found here. This is from Reed Timmer who you may know from his Discovery Channel show. Now with all severe weather there is some damage and causalities. However several cities and towns have dodged major bullets as strong tornadoes have passed just outside populated areas. Today is another chance for severe storms and tornadoes in the Central US. 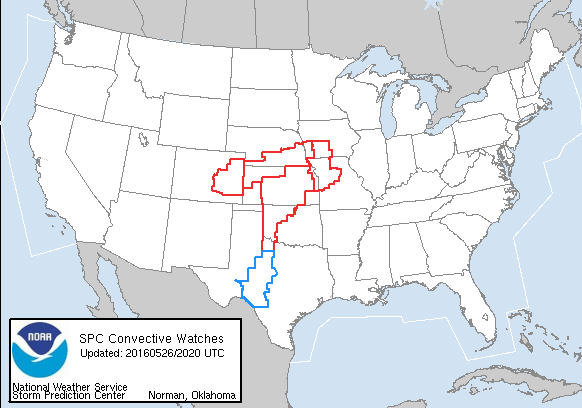 All of the red boxes are tornado watches. The blue is a severe thunderstorm watch. Let's hope these tornadoes stay away from populated areas again today. Even though this is tornado alley 4-5 straight days is a little ridiculous. 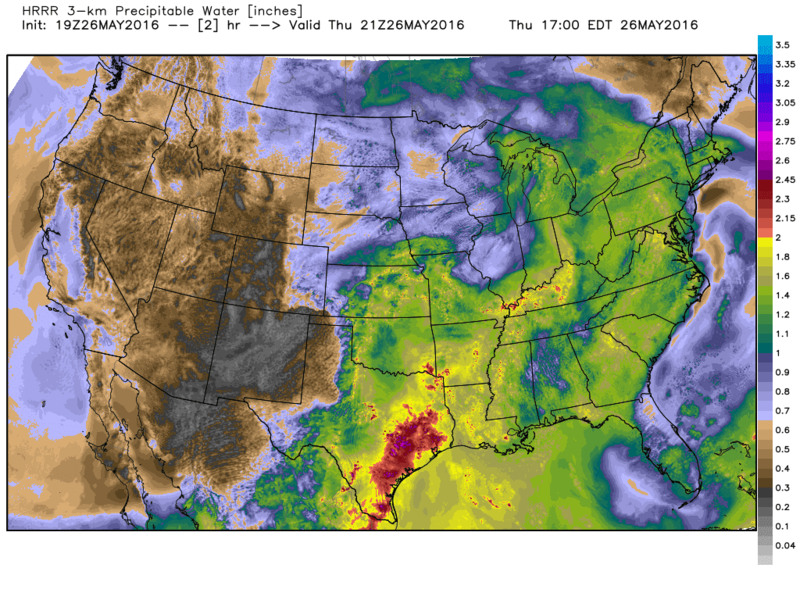 But a deep trough in the Rockies combining with a eastern ridge is creating unstable conditions. The flow into the plains is warm and tropical while the Canadian air dropping into the west is cool and dry. Toss in a wind change with height and we have a good severe weather set up. Conditions should become more favorable by Saturday. The Air Force will investigate the system tomorrow afternoon. Come Tuesday-Wednesday, whatever this system is, may help enhance precipitation in Southern New England. Now that I have crashed your browser with all these graphics and GIFs I'll leave it here. As I said above one more forecast tomorrow for the weekend. I'll be tracking any potential thunderstorms over the weekend but you know...its a holiday weekend. The unofficial start of summer is Memorial Day weekend and for once Mother Nature agrees. Although temperatures will back off from the mid to upper 80's on for Sunday/Monday it will still be warm. There will be isolated afternoon showers/thunderstorms on Friday but I am hopeful that most of the action on Saturday is to our west. On Sunday a front from our east will touch off isolated showers before moving back east on Monday. High pressure is now in control as yesterday's low pressure system departs. Our wind direction hasn't completely flipped to the west yet so temperatures are in the low 70's in some places. But even I was write this and look at the local weather station network I notice a lot of stations are rising rapidly. 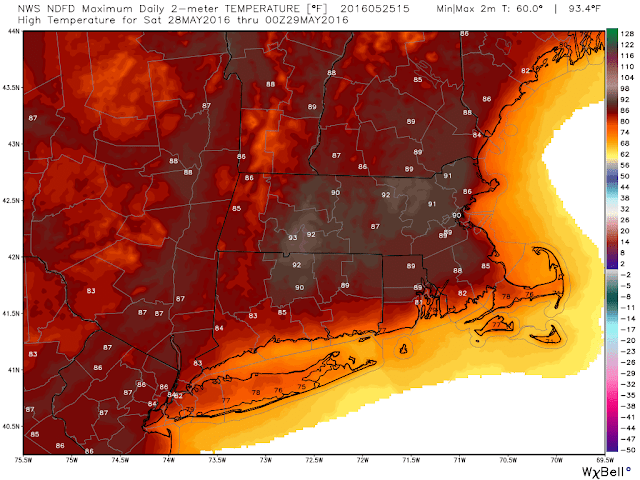 Local high resolution guidance is forecasting upper 80's for most this afternoon. Look how awesome it captures the sea breeze effect. 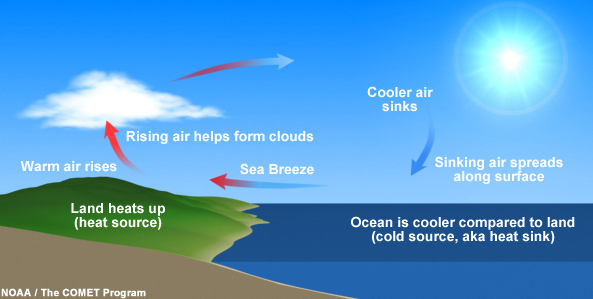 So why does the sea breeze have such a profound effect on the coast? The answer lies in the ocean temperatures. 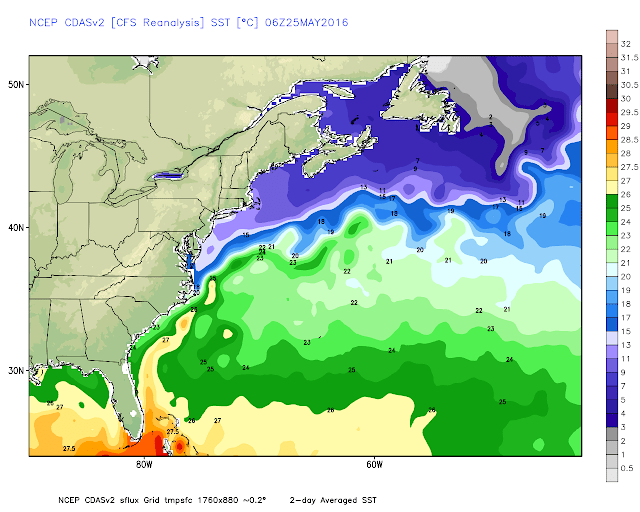 They are still chilly from the Mid Atlantic on north. For those heading to the coast this weekend you are now warned that it will be much cooler at the coast than inland. Low temperatures Thursday morning will be around 60 region wide. A cold front will push south on Thursday. This front will be fairly weak but it may set off a shower or thunderstorm later in the day. Temperatures will be similar to today with highs in the mid to upper 80's. Dew points will be higher tomorrow so it will feel more humid. Here is the forecast surface chart tomorrow evening. A greater chance of scattered showers/storms will be overnight Thursday into Friday. This cold front will stall and lift north a warm front. The precipitation wanes by daybreak and we will be left with a warm and sunny day. Here is the Friday AM surface forecast. I do want to watch and see if the shower activity holds on a bit longer Friday morning. 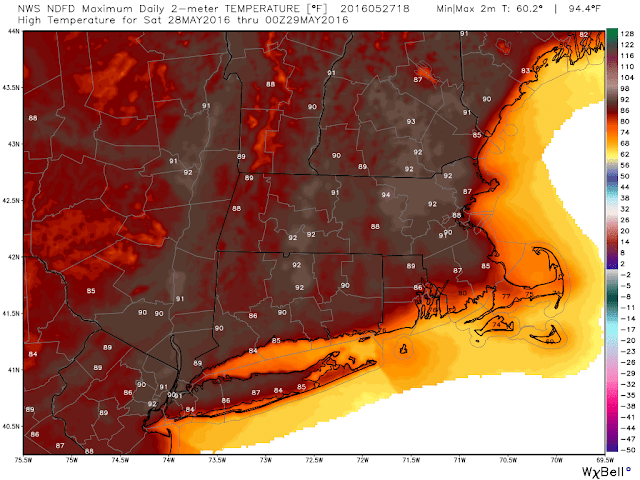 Temperatures Friday will be in the mid 80's north and west of the Boston-Providence-Hartford line as some ocean air works into the coastal plain. 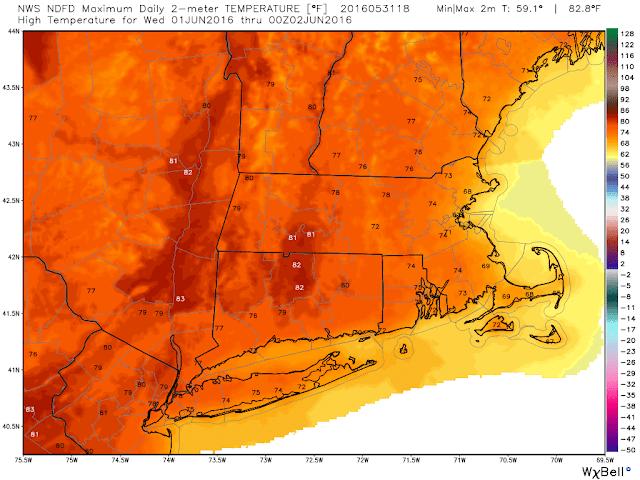 The usual warm spots- Connecticut River Valley, Merrimack Valley will be the warmest. It will also be humid with dew points in the 60's. Hopefully the southwest wind will be strong enough to keep everyone comfortable. 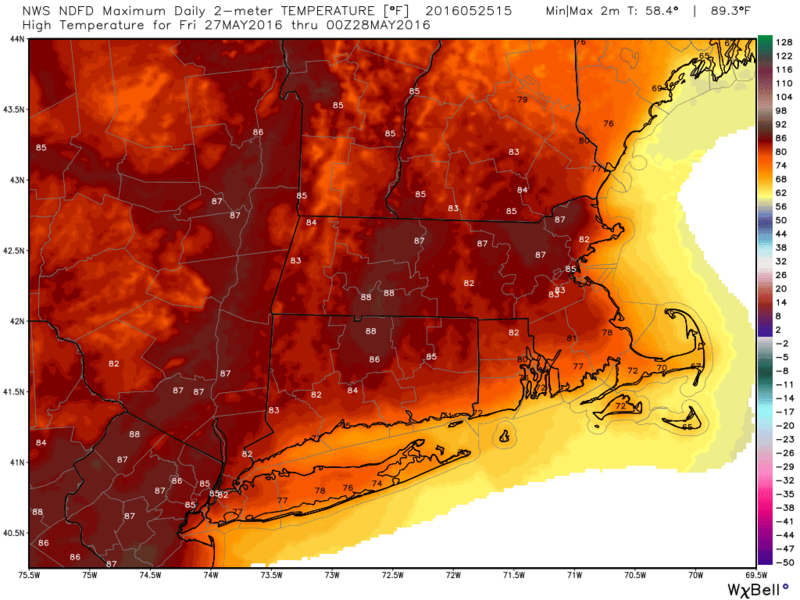 Saturday is simply hot and humid. I believe the day will be mostly dry in Southeastern New England but I can't rule out a shower/thunderstorm in Western MA. This is Worcester, Boston and Providence's best day to hit 90. The boundary will linger in the area Sunday and Monday. If you are to the west or south of the boundary temperatures will be in the 80's. If you are to the east or north of this temperatures could drop into the 60's. Anytime there is that steep a temperature gradient there is a chance for showers/thunderstorms. Monday the front weakens so odds favor a mild and sunny day. I'm thinking temperatures around 80, cooler at the coast. Now notice the area of low pressure sitting off the Georgia coast Sunday AM. If you can recall the sea surface temperature graphic above you will remember this is sitting over warm water. Hurricane season does not start until next Wednesday but it is possible a Tropical or Subtropical Storm forms off the Carolina coast. This will have no bearing on the weekend forecast here in Southern New England but it may play a role in our weather next week. There isn't much to move this system so it will sit and spin offshore. It may enhance moisture in New England the middle/end of next week. The National Hurricane Center gives the low a 50% chance of developing into a tropical/subtropical storm in the next 5 days. Here is the radar as of 8 AM. I feel this could be overdone in Eastern MA but keep the umbrella handy and give yourself an extra 15 minutes if you are commuting this morning. The rain shifts to Western MA and Northern CT this afternoon. We should stay dry in Central and Eastern MA/RI. Northeast winds keep temperatures around 60-65. Winds begin to shift this afternoon and temperatures will rise overnight. I have some changes to my weekend forecast that I will discuss in my next post. Summer? Oh There You Are!